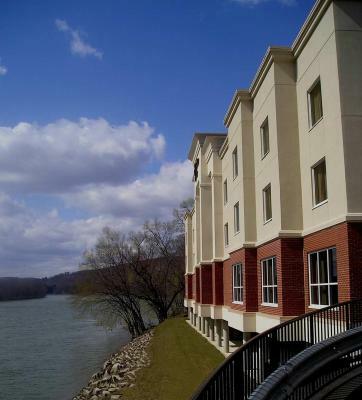 Lock in a great price for Hampton Inn Owego – rated 9.1 by recent guests! The hotel is very nice and exceptionally clean. Staff was very friendly. The complimentary breakfast was great!!! Had everything you could possibly want and was all excellent. Bed was very comfortable, breakfast was very good, and we were hsppy that we could turn off the heat when we turned in. Wife LOVED the shower! Rooms was clean, bed comfortable. Enjoyed the breakfast- glad it was served until 10am. The room was clean, roomy, and comfortable. Breakfast was good. The dining area had plenty of room for everyone, newspapers, and news on the TV. 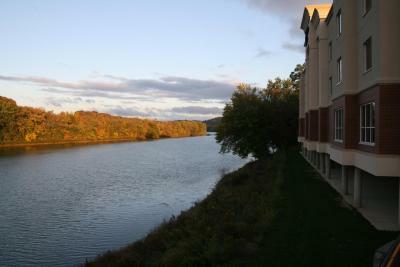 The view from my bedroom was of the river and the trees with autumn colors. The river view room was spacious and the bed very comfortable. The place is clearly tops in Owego! We were there for a family reunion. The staff were so kind and accommodating. We had an amazing time and thoroughly enjoyed our stay. We had the pool to ourselves, and the night was helpful. We also liked the fitness center being open til midnight. Hampton Inn Owego This rating is a reflection of how the property compares to the industry standard when it comes to price, facilities and services available. It's based on a self-evaluation by the property. Use this rating to help choose your stay! Nestled next to the Susquehanna River, this New York hotel features river views, an indoor pool and gym. The spacious rooms at Hampton Inn Owego offer cable TV with HBO. Free wired internet and a coffee maker are provided in the contemporary rooms. There is also a desk and arm chair. The studios feature a sofa bed, microwave and refrigerator. Guest can enjoy a daily hot breakfast. 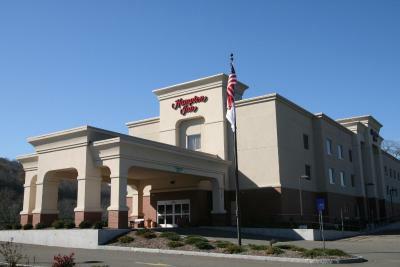 Owego Hampton Inn also offers free daily newspapers and a business center. Hickories Park is within a 10-minute walk from the hotel. Tioga Theater and Tioga Scenic Railroad are within a 10-minute drive. This property also has one of the top-rated locations in Owego! Guests are happier about it compared to other properties in the area. When would you like to stay at Hampton Inn Owego? House Rules Hampton Inn Owego takes special requests – add in the next step! Hampton Inn Owego accepts these cards and reserves the right to temporarily hold an amount prior to arrival. Front desk staff was EXCELLENT!! Breakfast was delicious! The heater was very noisy. It was not good for light sleepers. We're glad that we could turn it off. The lighting in the room was cold, glaring, and uncomfortable. The pool was closed. Very comfortable room with great breakfast. NOISIER than I thought it should be for a Hotel. Sounded like people were coming through the ceiling it was SO LOUD. Very clean, pool was fun and breakfast was good. Location of our room. Due to many children at hotel, they were above and across from our room and were very noisy. I have grandchildren so I get it, but I would suggest the top floor being reserved for individuals/couples who might appreciate a quiet stay. No access to the roof would've liked to see the view from there, no room service.